The Russian left doesn't just belong to the past. 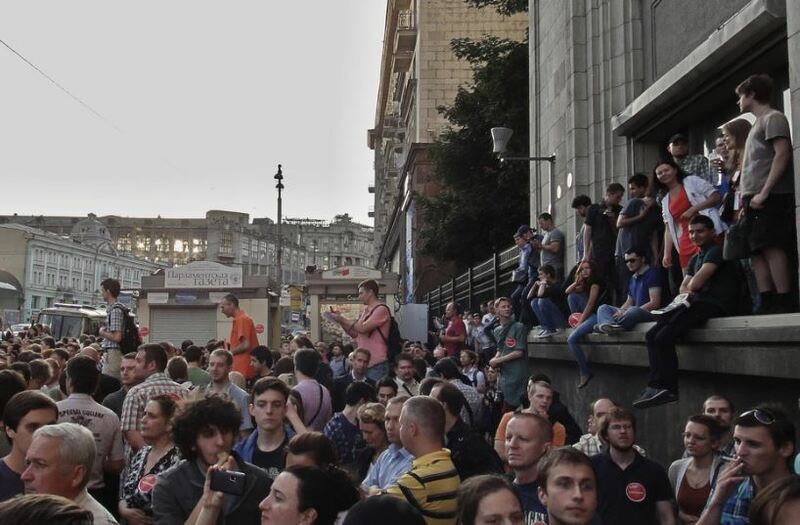 It can use the surge around Alexey Navalny to grow a new independent movement. This year, the Russian anti-corruption and opposition politician Alexey Navalny initiated nationwide protest rallies in eighty cities on March 26 and more than one hundred on June 12. Both days of action demonstrated a sharp uptick in popular discontent and revealed the growing politicization of young people and residents of provincial cities. Indeed, many of the protesters who joined Navalny’s rallies didn’t participate in the mass demonstrations that were mostly concentrated in Moscow in 2011–12. These newly minted activists took to the streets to fight the nation’s pervasive corruption, growing economic inequality, and crumbling living standards. This popular upsurge caught the Russian left flatfooted. Though many committed activists and adherents remain in the movement, repression has weakened it, and disagreements over the annexation of Crimea and the Russian intervention in Ukraine have divided it. How should the Russian left — not to mention the international socialist movement — respond to this upsurge and, especially, its leader? For many American and European leftists, the Russian left appears as an artifact. They valorize Russia for its revolutionary past — taking its desires and achievements as a source of inspiration and its mistakes and tragedies as a cautionary tale — but reduce its contemporary manifestation to a caricature. At a moment when Russia and Vladimir Putin sit at the center of intense popular discussion, Western leftists need to become aware of Russia’s various oppositional political forces, the realities they face, and the alliances they can build. The Russian left wasn’t alone in its bewilderment this June. The Kremlin and the older generation of Russian liberal opposition were also surprised. Navalny quickly became the object of not only scurrilous attacks in the Russian state media but also criticism from a number of opposition pundits. Unfortunately, a considerable portion of this criticism ignores the political context, engaging in an abstract discussion of Navalny’s electoral program. Attacks on irresponsible “populism,” which Russian liberals have taken as a mantra after Brexit and the recent European election cycle, were automatically transposed onto Navalny. For example, liberal economist Andrei Movchan argued that the demand for a 25,000 ruble monthly minimum wage (about $440) panders to Russia’s poorest and threatens the middle class’s current standard of living. Provocative journalist Oleg Kashin attacked Navalny in the New York Times, calling him an authoritarian leader and comparing him to Boris Yeltsin. Vladislav Inozemtsev, a theoretician of the so-called postindustrial society, fears Navalny doesn’t have a “vision for the future” that can replace his impudent populism. Unfortunately, even leftists have joined this skeptical campaign. Alexey Sakhnin and Per Leander recently called Navalny “the Russian version of Donald Trump.” They listed some indisputable facts, but Sakhnin and Leander took them as signs that Navalny’s entire movement is xenophobic and pro-market — essentially identical to Trump’s exploitation of social discontent for political power. Criticizing Navalny with such a specious comparison makes leftists outsiders to the movement, as if its future will have no impact on their prospects. Further, the article concludes that Navalny’s defeat will clear a space for a Russian Bernie Sanders — a true progressive leader with the right platform — implicitly accepting Putin’s reelection in the hopes that a more left-wing politician will step forward. Many of these criticisms depend on the belief that Navalny will participate in next year’s presidential elections, but this outcome is far from certain. For one, his freedom remains in jeopardy. The Russian state has already jailed his brother Oleg on trumped-up charges, effectively turning him into a hostage. Navalny himself is serving a suspended sentence — which Russian Federal Penitentiary Service officials have repeatedly asked to convert into real time — and faces other false corruption accusations. Navalny’s fate is intertwined within the opaque working of the Putin machine. There will be nothing democratic about next year’s elections: Putin is preparing to be triumphantly returned for another term. Indeed, elections have become a ritual with fake candidates, vote rigging, and a preordained outcome. Political scientist Gregorii Golosov calls them “electoral event[s]”: they superficially resemble the people’s democratic will but simply act out the Kremlin’s prewritten script. Since he’ll invariably be excluded from this performance, Navalny has tried to undermine it from offstage, by sparking politicization from below. Because the government is unlikely to allow him to run for election, Navalny will probably call for a boycott of the presidential elections instead. The Left should support this call. We should stand in solidarity with Navalny, demanding an end to repression and the creation of democratic opportunities. In addition, we should welcome the fact that his campaign has merged the issue of political freedoms with Russia’s colossal inequality. Alongside an end to corruption, Navalny and his supporters demand the fair redistribution of income from natural resources and from the privatization of former Soviet enterprises. This doesn’t require unconditional support for Navalny or his personal politics, which are difficult to evaluate. In interviews, he insists that he is neither on the right nor on the left, but he nevertheless tries to rally both. His main campaign slogans call for abstractly progressive changes: government transparency, support for small businesses, democratic rights — which include allowing the far right to participate in political life, permitting atheists to publicly declare their beliefs, and putting the right to gay marriage up for public vote. Speaking from these abstract positions, Navalny attacks everything he associates with the archaic, especially Putin’s moralizing traditional values, which has intensified thanks to the Russian Orthodox Church’s censorship. At the level of declared values, Navalny shares little with Trump, who built his campaign on isolationism and xenophobia. Moreover, Navalny’s campaign has taken strong positions on the Russian economy. He criticizes government authorities not just for being undemocratic but also for creating a predatory system that only profits the top 0.1 percent. While we can’t call him a genuine social democrat, he’s certainly not Trump, whose tax plan greatly benefits the American counterparts of those Navalny attacks in Russia. Regardless, leftists can use Navalny’s campaign to show that attacks on corruption will not change the politics of authoritarian post-Soviet capitalism. Effective criticism of individual multimillionaires is not the same as a consistent critique of the free market. Navalny’s socioeconomic demands, including the new minimum wage, won’t substantially improve people’s livelihoods if it doesn’t include a powerful mobilization of workers from below. If Navalny wins — a doubtful result — it won’t be through Putin’s staged election but through a street movement that sends the entire ruling system into crisis. The politics he will ultimately practice will be connected to this movement’s dynamics, and the Left can help push them in a more progressive direction. Leftists should prove themselves as Putin’s most consistent and active critics, not as Navalny’s opponents. We must participate in street mobilizations, as activists from the Left Bloc and the Russian Socialist Movement are already doing. More leftists should participate in this movement, show unconditional solidarity with its democratic demands, and support and develop the socially progressive elements of Navalny’s program. Only then can we criticize it for its undemocratic decision-making, its flirtations with Russian nationalists, and its commitment to the free market. The Russian left must also recognize that the movement Navalny has inspired is not the only locus of politicization. Labor conflicts, though small, localized, and diffused, have increased over the last year, particularly around the issue of owed wages. Urban and rural communities have been actively fighting against ecological destruction, industrial pollution, gas pipeline construction, and the eradication of urban green space. Long-haul truckers have similarly been protesting for two years against the new transport tax, the collection of which Putin outsourced to the son of one of his billionaire cronies. The authorities’ attempts to crush these demonstrations — as during the recent protests against so-called housing “renovation” — have only created more activists. These, in turn, feed a new wave of opposition politicians at the municipal level, including some avowed leftists. By engaging with this evolving political atmosphere, participating in social movements, and strengthening the left media, the Russian left can grow into an independent force. For all its faults, Navalny’s movement has produced more positives than negatives, prying open political spaces in a regime reliant on citizen passivity. The Left, both in Russia and all over the world, must embrace this opportunity for the future democratization and the realization of social justice in Russia. Ilya Budraitskis is Moscow-based political writer. He is a member of the editorial board of Openleft.ru. Ilya Matveev is a researcher and lecturer based in St Petersburg, Russia. He is a founding editor of Openleft.ru and a member of the research group Public Sociology Laboratory.